It's safe to say Maikel Franco has had a bit of a checkered past in Philadelphia. Once regarded as a premier prospect with a bright future, his value took a nose-dive earlier this season as he underperformed at the plate. To this credit though, he's fought to improve himself and over the past month has been a vital reason why the Phillies sit atop the NL East standings. 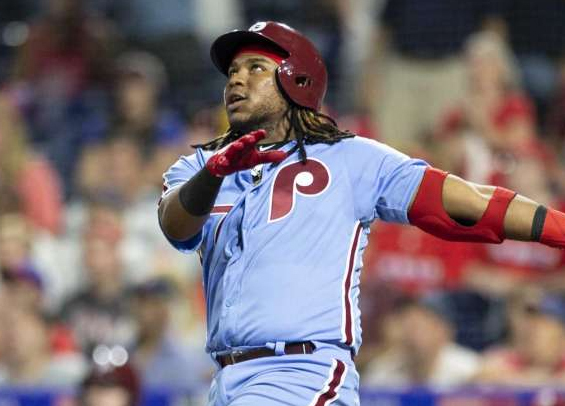 Franco added an exclamation point to his efforts on Thursday night, clubbing a two-out, three-run homer in the bottom of the ninth to give the Phillies a 5-2 walk-off win over the Marlins at Citizens Bank Park. The win pushed the Phillies record to 60-48 on the season and more importantly allowed the club to maintain a half-game lead over the Braves in the divisional race. Franco, who was benched back in June due to a lackluster performance at the plate, has led the Phillies offensive charge over the last month. He's hitting .318 over the last 28 days with eight home runs and 16 RBIs. His OPS of .986 is 23rd-best in all of baseball. "What I think it says is people are motivated by different things," Phillies manager Gabe Kapler said afterward (see video). "Mikey turned a moment that wasn't necessarily what he wanted into real motivation. And since that day, he has been running every ball out. He has been preparing like a mad man. His process has been exceptional. He's made some swing changes. He's made some approach changes at the plate. He's among our best hitters. They flashed his July stats up there. They were sensational, and August is off to a good start for him as well." Marlins closer Kyle Barraclough opened the ninth inning with a leadoff walk to Rhys Hoskins. He then surrendered a one-out hit to Carlos Santana and walked Asdrubal Cabrera before allowing Nick Williams to hit into a fielder's choice up the middle to even the contest at 2-2. Franco then delivered the knock-out blow. "We know how to take a punch, we know how to get back up, and we know how to keep fighting," Kapler said. Hoskins hit a solo shot in the sixth to bring the Phillies to within a run, marking his eighth blast in his last 12 games. Starter Nick Pivetta pieced together a solid performance, tossing six innings of two-run ball with the lone mistake coming on a change-up to Justin Bour in the fourth that resulted in a two-run blast for the Marlins. He surrendered four hits, walked none, and struck out seven. "He attacked the zone all night, his fastball was live," Kapler said. "He dropped some really good curveballs and sliders at times, and it's the reason we have so much confidence in him going forward." The two clubs resume their set on Friday at Citizens Bank Park with right-hander Vince Velasquez opposing Marlins right-hander Trevor Richards.